In the third pAsuram, since AzhwAr did not have his desires fulfilled even after calling out like this, he thinks “Hopefully emperumAn is not thinking that I will conduct my activities on my own” and says to emperumAn “you should mercifully fulfil my desires”. Subsequently, AzhwAr says “I who am an akinchana (empty handed), do not want my desires fulfilled from anyone other than you; you who made me like this, should see that I serve at your divine feet forever”. kidandhAy – Oh one who is mercifully resting! kAN – kindly see to it. What activity shall I do [to protect myself]! Who [else] is the protector! what are you planning to do to me? I won’t pray to anyone else other than you to fulfil any of my desires. Oh one who is mercifully resting in thirukkudandhai which is surrounded by abundantly firm fort! You kindly see to it that I who am your servitor hold on to your divine feet until the time I am uplifted, for as many days as it may take. aru indicates AthmA which is atomic in nature. [In SrIvachana bhUshaNa dhivya SAsthram sUthram 46, “en nAn seygEn” is quoted. 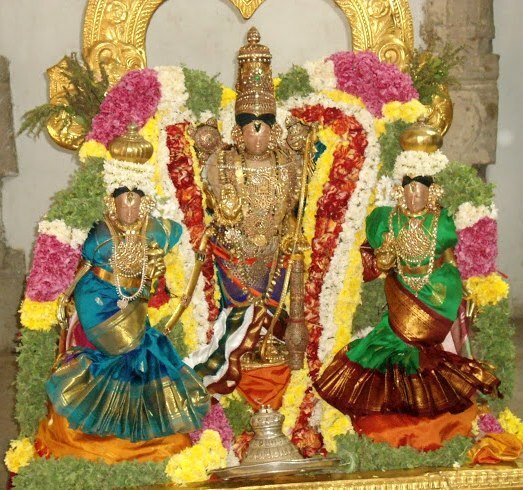 In the previous sUthrams it is explained that one may surrender to archAvathAra emperumAn due to agyAnam (not having knowledge to practice other means), adhika gyAnam (being greatly knowledgeable about the nature of self being totally dependent on emperumAn) and bhakthi pAravaSyam (overwhelming devotion). This sUthram explains that AzhwAr exhibits all these three qualities while surrendering to emperumAn. Let us see how this is explained by piLLai lOkAchAryar and maNavALa mAmunigaL. First, AzhwAr says “what can I do?” to indicate that he has no knowledge to practice other means and hence he is surrendering to emperumAn. emperumAn asks “But I have bestowed you unblemished knowledge, so why don’t you use that and practice any of the means such as karma yOgam, gyAna yOgam, bhakthi yOgam etc?”. For that, AzhwAr says, “As you have bestowed me with unblemished knowledge, I realise that I am fully dependent on you and so I cannot practice any other means which are contrary to the total dependence; so, what can I do?”. en nAn seygEn yArE kaLaikaN ennai en seyginRAy – Have you left it to me to take care of myself? Are you leaving to others to protect me? Or are you planning to protect me yourself? en nAn seygEn – AzhwAr is not asking “what can I do?”, [he is thinking] there is no match between me and the actions that are to be done by me. yArE kaLaikaN – Can a drowning person rescue another drowning person? How can those who are not even qualified for sharing of mutual experience as said in SrI bhagavath gIthA 10.9 “bOdhayantha parasparam” do anything? ennai en seyginRAy – As said in periya thiruvandhAdhi 6 “neRi kAtti nIkkudhiyO nin pAl karumA muRi mEni kAttudhiyO” (Would you lead me to other upAyams and shun me, or would you show your beautiful form resembling dark leaf and uplift me? ), what are you thinking to do? en nAn seygEn yArE kaLaikaN ennai en seyginRAy -Don’t you know me? Don’t you know others? Don’t you know yourself? Looks like you are thinking of me to be an independent person who is capable of accomplishing his own goals! yArE kaLaikaN – How can those who are not up to my level [in attaining your mercy, or in knowledge/devotion], protect me? ennai en seyginRAy – Are you planning to fulfil my desires? Or, are you going to shun me by telling me “engage in some sAdhanam (means) and attain me” as naLa led dhamayanthi [to her parents’ place]. en nAn seygEn – AzhwAr is withdrawing from his own protection. yArE kaLaikaN – AzhwAr is withdrawing from accepting others’ protection. ennai en seyginRAy – Are you planning to tell me as in SrI bhagavath gIthA 9.34 “mAdhyAji mAm namaskuru” (worship me, bow down to me) [i.e., engage me in bhakthi yOgam]? Or are you planning to tell me as in SrI bhagavath gIthA 18.66 “mA sucha:” (do not worry) [krishNa telling “I will be your means”]? unnAl allAl yAvarAlum onRum kuRai vENdEn – If you told me “mAm namaskuru“, my grief will not disappear. Even to attain you, I would only do that through you; I would not want to attain you by me (my own efforts) or through others. Some explain this “unnAl allAl” in context of upEyam (goal) and say this as “Except for attaining you, I have no other desire”. yAvarAlum – Instead of saying “yAvaiyAlum” (by any means), AzhwAr is saying “yAvarAlum” (by any one) due to the fact that upAyam is associated with a chEthana (sentient) [only a conscious person can be the trigger for any means and the means are simply processes which on their own have no standing]. onRum kuRai vENdEn – Though other processes can [eventually] lead to fulfilment of one’s desires, since pursuing them is like having the deity of death decorating our finger with a ring, it is contrary to our nature, so I will not accept that. [AzhwAr is ] Just like sIthAp pirAtti who did not reach SrI rAma riding on hanuman who was ready to cross the ocean and take her to SrI rAma [attaining the goal through others] or by cursing [rAvaNa to be destroyed, that is by her own efforts/abilities]. That is, destroying the true nature of both [bhagavAn and AthmA, by doing what is contrary to their nature]. I do not want anyone to remove any of me worries. kannAr madhiL sUzh kudandhaik kidandhAy – The manner which AzhwAr’s means (emperumAn) is securely present. [AzhwAr is happy about emperumAn being protected in the fort] It is the responsibility of those who remain with emperumAn as the upAyam and upEyam, to protect him due to overwhelming care towards him. As said by periyAzhwAr in thiruppallANdu 1 “sevvadi sevvi thirukkAppu” (let his divine reddish feet be protected]. kannAr madhiL – The fort which has abundance of activities, copper and firmness [kan has these three meanings]. adiyEn aru – This AthmA which exists exclusively for you without even a tinge of self-interest. vAzh nAL sen nAL en nAL – The day in which I will be uplifted. an nAL – Until that day. una thAL pidiththE selak kANE – You should mercifully see that I am constantly beholding your divine feet. You should mercifully ensure that I don’t even leave them for a fraction of a second. AzhwAr is saying – you did not come and fulfil my desire when I said “I don’t want anything from anyone”; I may get that experience some day; but until then you mercifully ensure that my faith does not diminish as said in “unnAl allAl yAvarAlum onRum kuRai vENdEn“. If he lets go of the divine feet, then his faith will diminish. One who lived by holding on to his divine feet, will not let them go now [also, explained as, from the beginning, AzhwAr was holding on to his divine feet and will not let go of them now]. With this faith, AzhwAr is a parama bhakthi yukthar (fully situated in ultimate devotion), and so what is the reason for [emperumAn‘s] delay? emperumAn is keeping him here to nurture his bhakthi further and to reform the world with his love-filled words. This entry was posted in thiruvAimozhi, thiruvAimozhi 5th centum on August 23, 2017 by Sarathy Thothathri.